Dr. Gur is so intense. Limited exposure is favorable. @ Jen I guess we will see, But I think He will be found guilty and not insane at the time of the shooting. I start twitching each time I hear Gur's voice. @jen i think it'll be that the people who think he wasn't sane will be alternates. judge in court now, but no jury. Wants to make a record, take a short break, then bring in the jury. @deb I read the about the charges he faces on a different web page this morning and it helped me understand better then what happened in court Friday and yesterday! Jen, the jury's verdict will be unanimous. If one or 2 jurors think James was insane, that isn't going to sway the other 10. Realistically, the jurors in the minority will have their opinions 'swayed' by the majority. @Humblepride Agreed. No chance he gets death. Wow...look at that evidence. It breaks your heart. Anyone out there thinks that there might be a Hung Jury ? Reminder; Jury is not in the room yet. This is a final meeting before a short recess and then the jury will be brought in for their instructions. Will the model of the theater be going back as well? I remember that there was some discussion of it early on, but I can't remember what the outcome was. Yo, Brauchler, easy buddy. RLS much...? Defense requests no additional changes to instructions or forms, but says they 'maintain" all previous objections. I don't think there will be a hung jury. I think there will be actually. Is there any estimate as to how long the jury instructions will take? About 90 minutes from what the judge said on Friday. @Phil...when will the announcement of deliberating jurors be made? 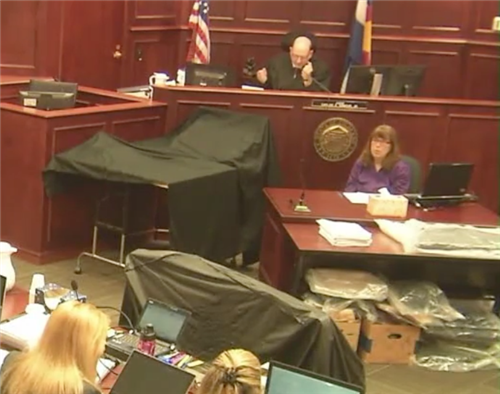 Judge says attorneys will get chance now to review each other's demonstrative exhibits. Isn't it the judges hope to send the jury back for deliberations later this afternoon? Why are they allowed to make objections during closing arguments? It seems ... not right somehow. @kdsmith By limiting the closing arguments to 2 hours that seems very likely. @Phul - Oh...you know we love you best! @PA Watcher... Thank you. I suppose it would make sense to let them object - emotions and the heat of the moment could lead people to "mis-statements" of law and facts. What are we watching right now?